Previous: ARE SUPERMARKETS THE NEW RAVES? 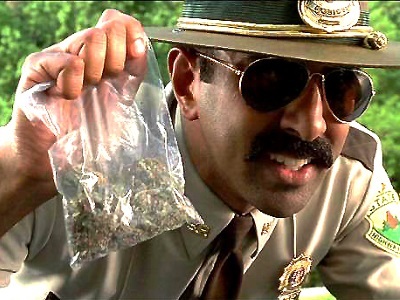 Police officers in the city of Whalesberg, Oregon, will be handing out free marijuana to citizens on April 20th, a day when pot enthusiasts around the world celebrate their love of getting high. “Oregon is paving the way to end the war on drugs,” says Martin Crishugelé, a spokes person for the Whalesberg police department. “Across America, countless lives are ruined by the war on drugs and the officers of Whalesberg are taking a stand,” says Martin. “We’ve decided that handing out free marijuana to people who are of age is a good way of letting the rest of the country know that pot is harmless. The war on drugs is not." Harriet Chiamanti, the long time mayor of Whalesberg, says that she support her police department’s marijuana giveaway. “When Chris Burner, the chief of police, came to me with this idea, I was skeptical. However, the more he explained his reasoning, the more it made sense to me,” says Harriet. “The war on drugs doesn’t work. The city of Whalesberg is taking an explicit stand against Washington D.C. We’re telling congress and we’re telling the white house that enough is enough. It’s time to end the war. On 4/20, we invite everyone in Whalesberg to get high. And do you know what will happen? Nothing dangerous. The world won’t end. People won’t kill each other. Our children won’t suddenly start worshipping Satan. Life will continue on as it always has, and that is what we want to communicate to everyone in America. We are spending billions and billions of dollars on a war against a very mild drug. It needs to stop." Politicians in Washington condemned the plans. “Just because marijuana is harmless doesn’t mean it should be legal,” says Berryl Bellbottom, the senator for the state of Miami. “We made marijuana illegal for a very good reason, to discriminate against racial minorities and to protect the financial interests of logging companies who were in competition against hemp farmers. If we suddenly make marijuana legal, if we suddenly end the war on drugs, it will be way harder for the legal system to discriminate against people based on their race. We’ll have to come up with entirely new reasons to throw black people in jail. The democrats don’t want that, the republicans don’t want that, and American doesn’t want that. No, the war on drugs is doing exactly what it should be doing: keeping America safe from racial equality. I say no to legalizing marijuana and so should you." Harriet says that Mr. Bellbottom’s words left her speechless. “At least politicians in Washington are finally being honest about why they support the war on drugs,” says Harriet. “That’s a positive step in the right direction, I guess."